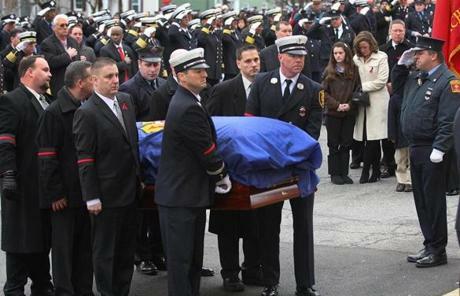 Thousands of mourners came to Peabody today for the funeral of fallen firefighter James M. Rice. 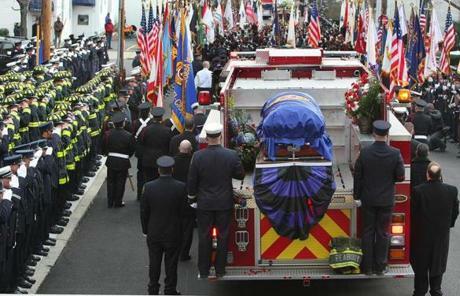 After the funeral service, his casket was driven to the cemetery atop Engine 5. 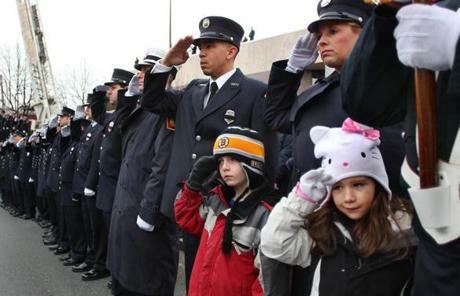 From left, Alex White, 8, and his friend, Paige Biscaia, 6, both from Salem, were allowed to stand in front of firefighters as they saluted. 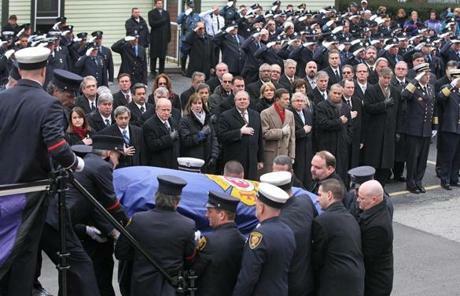 Pallbearers carried Rice's casket at the end of the funeral service. 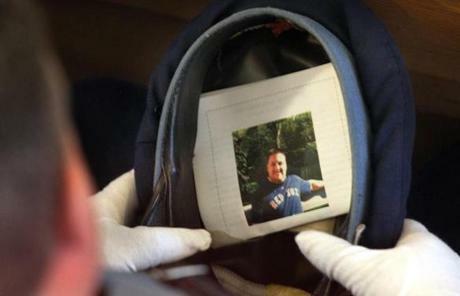 During the funeral service, a Massachusetts State Trooper kept a funeral program with Rice's photo inside his hat. Rice's best friend and Peabody Fire captain Jay Dowling hugged Rice's wife, Amy, inside St. John Baptist Church after he delivered his eulogy. 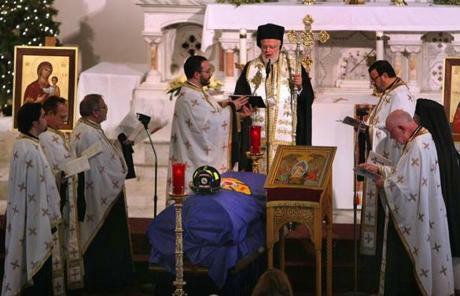 Speaking at the Greek Orthodox funeral service, Metropolitan Methodios described the 42-year-old Rice as a man with "character, courage and inner strength." 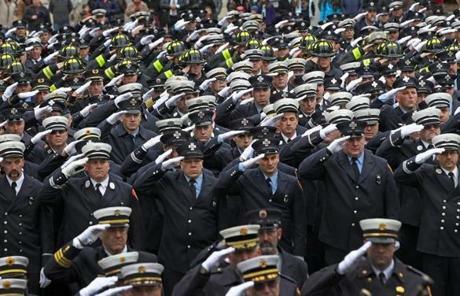 Firefighters saluted outside the church. 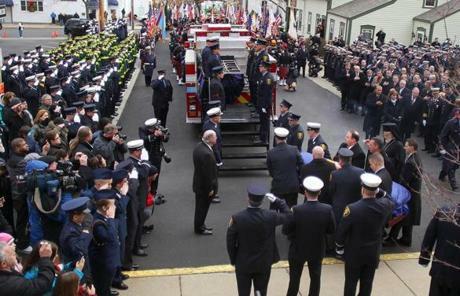 James Rice’s casket was carried into the church by his colleagues from Engine 5. 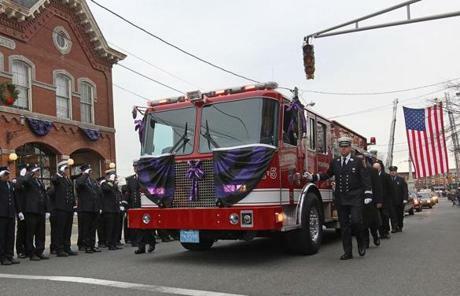 On the way to the church, Rice's casket was carried through Peabody atop a ladder truck. 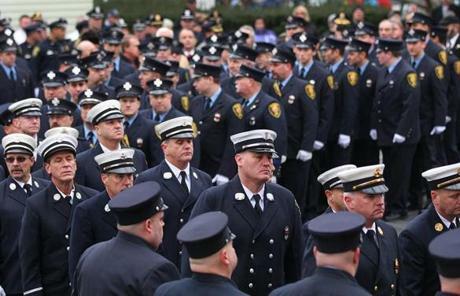 They moved past hundreds of firefighters, police officers, and numerous political figures. 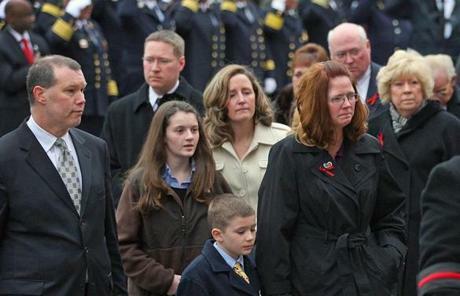 Rice's family walked behind the casket. Rice was killed last week while fighting an apartment building fire. 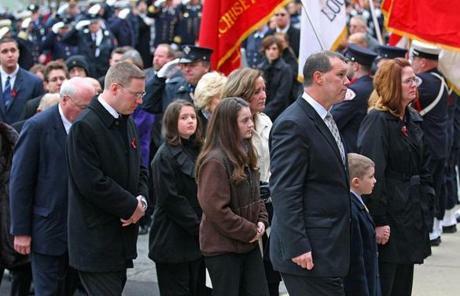 He leaves his wife, Amy, and their three children. 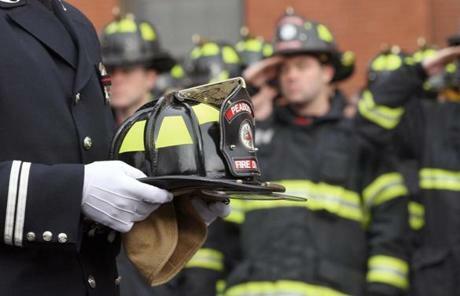 Peabody firefighters filed into the church today. 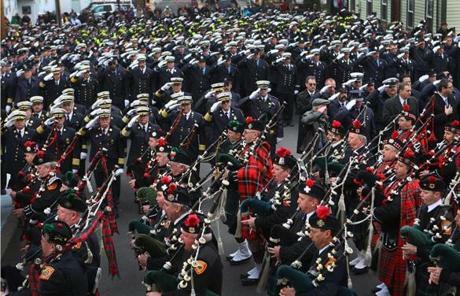 The procession this morning was led by fire department honor guards, Peabody Police, and a contingent of drum and bagpipe corps. 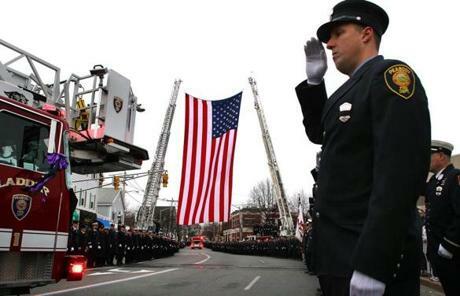 Peabody firefighter Dennis Kolodziej saluted a ladder truck carrying flowers as it passed through Peabody Square. 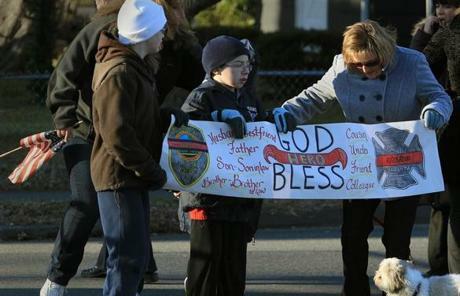 From left, Madison Conrad, Tyler Conrad, and Lisa Roberts, all of Peabody, held a sign for fallen firefighter James M. Rice yesterday. 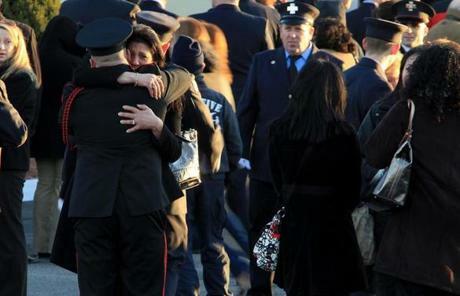 A firefighter consoled a woman outside of the wake at Conway, Cahill-Brodeur Funeral Home in Peabody yesterday.